Sandy’s Scotland Hat was designed with customization in mind. 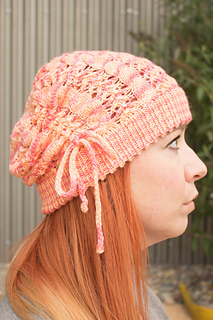 I send this lacy cabled pattern off with Laura (aka. 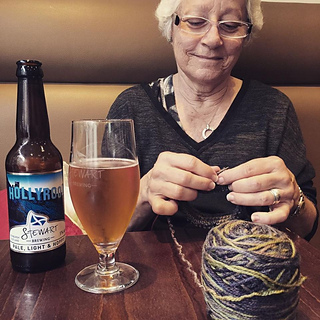 “Jimmy” of Jimmy Beans Wool), and co-workers Jeanne and Sandy, to knit on their recent trip to Scotland and the Shetland Isles. This was a special trip for these three as it was to celebrate Sandy finishing her recent Chemo treatment. 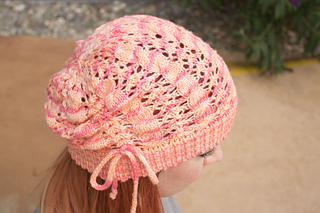 Sandy’s hat can be knit slouchy or as a beanie, with a folded brim or without, and with or without a drawstring cord to cinch it all down. 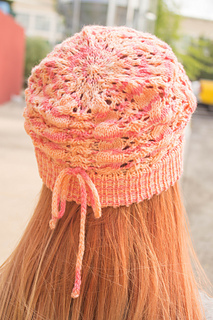 Knit in Lorna’s Laces Sportmate with its temperature regulating fibers, it’s a great hat for just about any occasion and year-round wear. What came back from Scotland was a trio of very different hats! 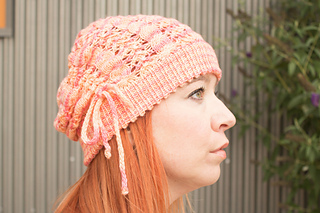 Jeanne knit hers with the folded brim, slouchy, and the i-cord (just like my version in the peachy Go Sandy Go color.) 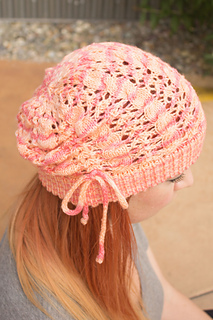 Laura went for a beanie style without a folded brim, and Sandy shortened her brim and made her hat more like a skullcap with a cute little cinch for added effect. All in all, these hats all look adorable and were the perfect way to commemorate their adventure. 28 sts = 4” in 1x1 rib on US 3 needles.